That is according to a recent survey. 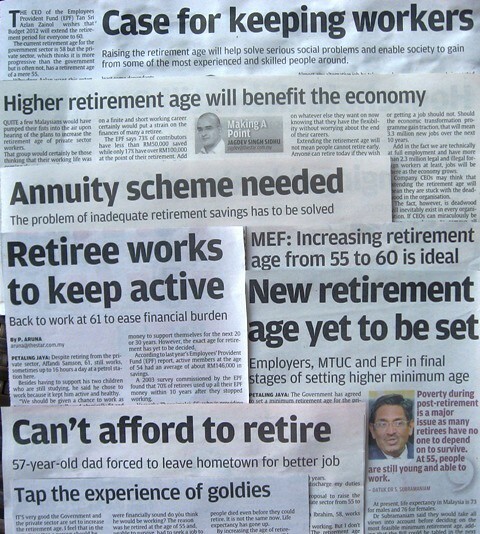 All this point to the need for Malaysians to better plan and secure their financial position towards retirement. Would the implementation of the retirement age at 60 be of much help? If 55 years is not good enough a number, then neither is 60. KUALA LUMPUR(Bernama): A study on retirement trends in East Asia has revealed the increasing vulnerability of Malaysians due to early retirement age as well as low rates of pension receipt under the Employees’ Provident Fund and the lack of old-age poverty floor. The study report, “Balancing Tradition and Modernity: The Future of Retirement in East Asia”, is based on a survey that the Centre for Strategic and International Studies (CSIS) conducted in Malaysia, China, Hong Kong, Singapore, South Korea and Taiwan, according to Prudential in a statement on the survey findings. The CSIS East Asia Retirement Survey reveals that an astonishing 92 per cent of current retirees in Malaysia report that they had already left the workforce by age 60 and suggests that Malaysia’s pattern of premature retirement will likely persist. Malaysia is the only country in the survey whose fertility rate is above the 2.1 replacement level and the only one that will have a growing population and workforce in the coming decades, the report said. “In China, the elderly share of the population will be approaching 30 per cent by 2040 — and in Hong Kong, Singapore, South Korea and Taiwan it will be approaching 40 per cent. In Malaysia, it will still be under 20 per cent,” it said. Malaysia’s early mandatory retirement age, however, offsets its demographic advantage in building an adequate and sustainable retirement system, it added. Co-authored by Richard Jackson and Neil Howe, it is part of the multilayer Global Ageing Preparedness Project, which was launched by CSIS and British insurance giant Prudential plc in 2010. The survey found four out of five of today’s retirees in Malaysia worry about “being poor and in need of money,” becoming “a burden on their children,” and being “in ill health and having no one to care for them” — much larger shares than in any of the other survey countries. Their vulnerability is attributable to Malaysia’s unusually early retirement ages, which leaves retirees at risk of outliving their savings, as well as to low rates of pension receipt under the EPF and to the lack of an age-old poverty floor, the survey said. Retirement prospects are improving for the younger generations, who expect to be less dependent on the extended family than today’s retirees are and to rely more heavily on their own savings, it said. But with one in five current workers still expecting to receive no pension benefits of any kind, the outlook for many is far from secure, it added. Donald Kanak, Chairman of Prudential Corporation Asia, which is part of Prudential plc, said: “Responding to the challenges caused by an ageing population is critical to Asia’s future. Charlie Oropeza, Chief Executive Officer of Prudential Assurance Malaysia Bhd, said: “The findings of the CSIS Study reinforce the need for Malaysians to better plan and secure their financial position towards retirement. “While the policymakers as well as the Malaysian Government have been introducing frameworks such as the Financial Blueprint to provide greater length and breadth of financial products and services, Malaysians need to be more aware and make themselves financially ready through prudent investment decisions. 60? no need la hehehe. if got 50 also i wan hahaha. @t--Ba, tehr - to tetire young is a wish come true, no?